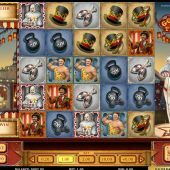 Golden Ticket slot brings us all an unconventional look at the world of the Circus with this highly detailed cascade-type slot. We have seen this grid model from Play'n Go featured in the classic Gemix and latterly Cloud Quest games and players either love it or loathe it. I personally like the idea, with winning tiles removed and creating Wilds and the B-O-N-U-S letters being exposed underneath them. 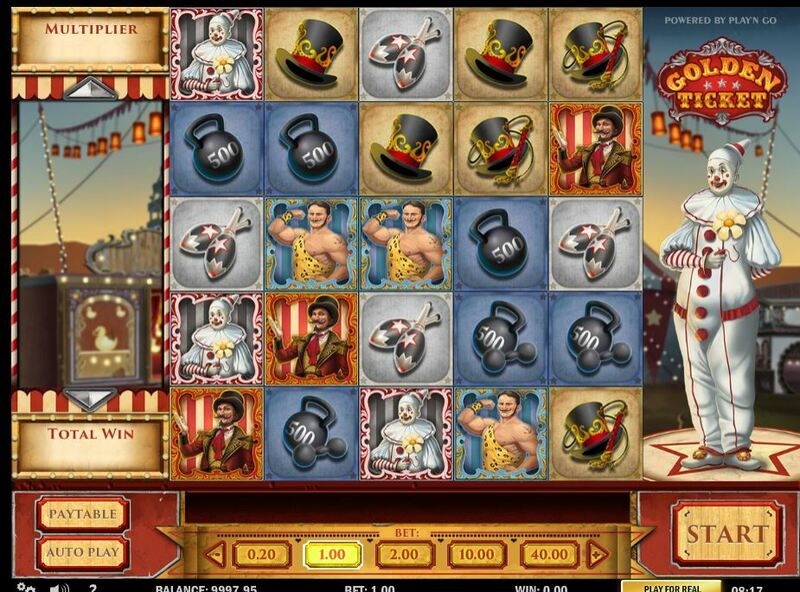 We play with all the traditional sounds of the big top (ah yes, Big Top is a Microgaming take on the theme too) such as bells, the audience and of course interjections from the resident clown that stands at the right of the grid. I must warn you that if have Coulrophobia (fear of clowns) you may want to look away now! We have a 5x5 grid with cascading tiles of which you need 3 or more to be adjoining but only vertically or horizontally, in or order to win. When you get wins of 3 tiles, they are removed except the centre ones which become a Golden Ticket Wild and remain on the grid. Each successive cascade increases your win multiplier up to 5x and on every play at least one column will have the 'BONUS' word overlaid under the 5 tiles and will be triggered if you expose all the letters, which can be difficult. 20 coins is paid per play and pays are as you would see on a standard reel game, i.e. 3, 4 or 5-of-a-kind. The best pay is the Wild at 500x bet should you fluke enough successive 3-icon wins to make this Golden Line, the Ringmaster at 25x, the Clown and Strongman at 15x with the Ringmaster's hats at 10x although the hats can pay mixed too. The Strongman's weights and Clown's skittles are the card value equivalents paying 50 or 150 coins. If you clear the grid not only will the bonus trigger but you will be given a nice 500x bet prize! Upon revealing the B-O-N-U-S letters under any column in full, you will be taken to a different grid. You get 5 free games for each column exposed as often a spin will have more than one column behind the icons. The symbols have now changed to 10 different ones with Lions, Elephants, stars and cakes etc. and your free games will be of a different format where the icons will pay scattered. There are values allocated for scatters of 5 or more icons to a maximum of 10 or more which are the top pays, the Lion being 175x bet for 10+ and the clown 150x with the balloons lowest at 75x. You can get 5 Bonus Tents too for the one 10-game retrigger allowed.